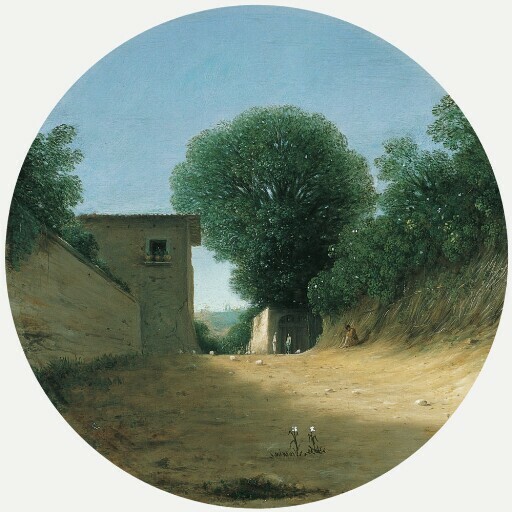 An early example of pure landscape painting, without historical, religious, or literary content, this rare copper panel records the effects of warm light bathing a country road at the close of day. The first work by Goffredo Wals to enter an American public collection, it is the prototype for a slightly larger variant in the Fitzwilliam Museum, Cambridge. Wals, an early teacher of Claude Lorrain, was born in Cologne and joined the Roman studio of Agostino Tassi after an initial stay in Naples. He was influenced by his fellow countryman Adam Elsheimer, who produced jewel-like landscapes on copper. Wals’s oeuvre has only recently been reconstructed; some thirty of his paintings have been identified to date. They show a radically fresh approach to nature and coloring; most are without prominent figures and employ strong contrasts of light and shade. The simplified settings, with an emphasis on straight and circular forms, convey an impression of serenity. purchased through (Richard L. Feigen & Co., New York) by Kimbell Art Foundation, Fort Worth, 1991.